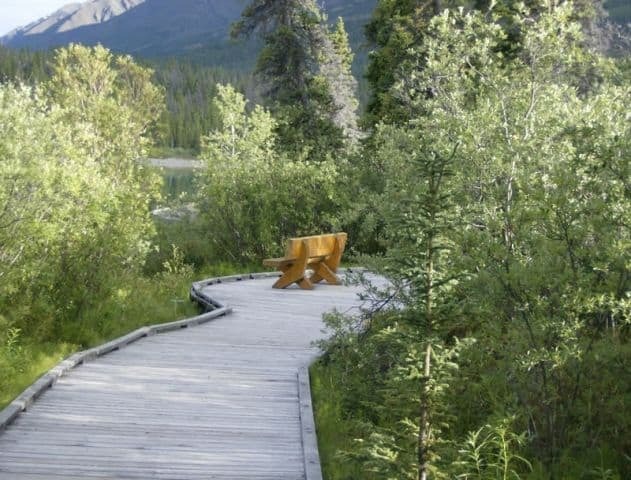 Kathleen Lake is a recreation park located on Haines Highway (Hwy #3) situated just south of the community of Haines Junction, Yukon Territories, Canada . 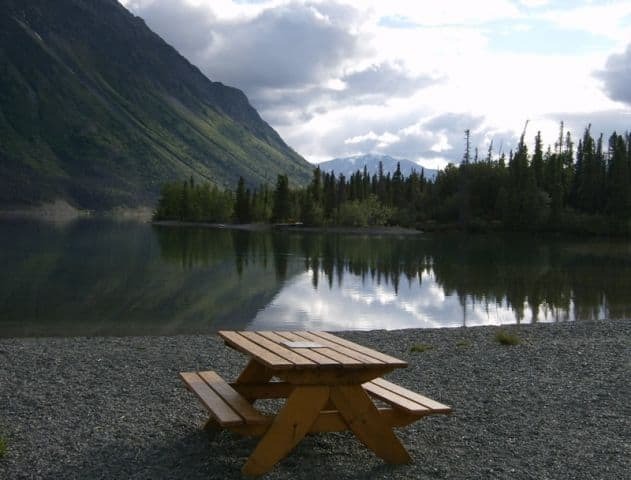 It is the only drive in campground/day use area located within the boundaries of the Kluane National Park & Reserve. Kathleen Lake is a unique lake in the region because it is a turquoise-green color and appears to be almost see through. Visibility is exceptional. In the background are monster mountains with snow capped peaks. The mountains stand right on top of the lake. It is very imposing scenery and very spectacular at the same time. 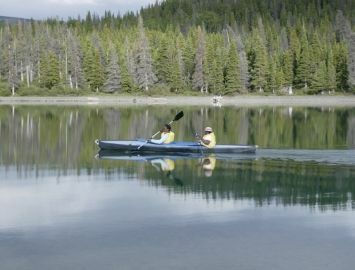 Kathleen Lake is a popular recreation destination for many Yukon activities year round. The lake is popular for kayaking, canoeing, swimming and fishing. The surrounding backcountry mountain trails are popular for hiking, backpacking, wilderness camping, horseback riding and cross country skiing. The lake shoreline is popular for picnicking, hiking and sightseeing. Fishing is for Kokanee Salmon. Kokanee are special fish as they no longer feel the need to return to the ocean as part of their spawning ritual. Kokanee are Canada's fresh water salmon. There is a boat launch located in the day use area of the park for fishing. A fishing liscence is required to fish in the Yukon Territories. The Day Use Area at Kathleen Lake enjoys a large gravel parking lot. There is a sandy, pebbled beach. Nearby are some picnic tables, viewing benches, a kitchen shelter, a canoe shed, a long pier, pit toilets and a boardwalk walkway. In the Day Use Area there is a short, well maintained wooden boardwalk trail following the shores of the lake. The boardwalk trail leads to a viewing platform. There are four viewing areas and many sitting benches located along the walkway. It is an ideal destination for birdwatching and for taking in the scenery. There are RV, camper and tenting sites in the campground. Each site includes a picnic table and fire pit. Some provide power. Other services in the campground include showers, pit toilets, a kitchen shelter and a water pump. There is a camping fee for overnight visits in the campground. 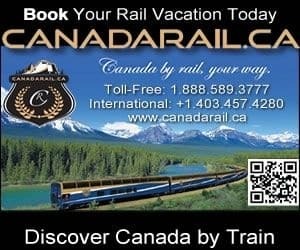 How to Get Here: Travel to the community of Haines Junction, Yukon Territory, Canada. From the community travel south for 27 kilometres on the Haines Highway to the park entrance.